The State of the World’s Volunteerism Report 2018 (SWVR), titled ‘The Thread that binds: volunteerism and community resilience’, places a spotlight on the relationship between resilient communities and volunteerism, finding that volunteers are a core strategy in building resilient communities. Volunteers are valued individuals who make unique contributions to developing their communities, and grow in the process. Amalie Boge (right), international UN Volunteer Health Systems Specialist from Norway, serves with the United Nations Population Fund (UNFPA) in Tanzania. 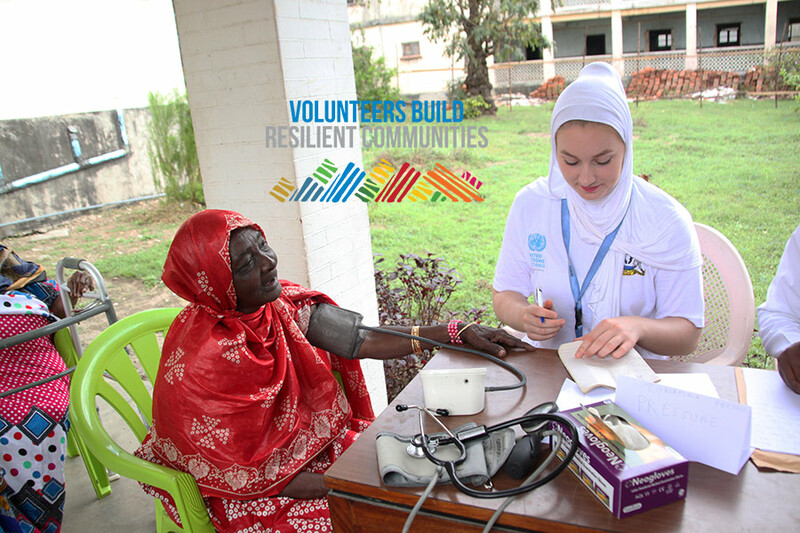 Here, Amalie checks the blood pressure of a resident of Sebleni Old People’s Home during an outreach activity organized by United Nations offices in Zanzibar. Where public support and social safety nets are absent, volunteering emerges as a fundamental survival strategy. For example, the SWVR found that in the Dzaleka refugee camp in Malawi, a group of people with disabilities organized to improve their limited access to education and to address their social exclusion in the camp. Without the voluntary networks they established, their needs would have remained invisible to others in the camp. Volunteers from across the region took time to marke this year’s International Volunteer Day (IVD) on 5 December 2018 under the theme ‘volunteers build resilient communities’. In Harare, Zimbabwe, the SWVR regional launch on IVD was facilitated by the UNV Deputy Executive Coordinator, Toily Kurbanov, and collected views, questions and feedback from over 600 volunteers from across the region. The launch provided a platform for raising the profile of volunteers in Africa, and the roles they play in building community resilience. A key message from the launch was that volunteers are essential as core foundations of truly resilient communities in Africa. The launch was part of greater series of activities that will included a youth dialogue on the role of Volunteerism in achieving the Agenda 2030 facilitated by UNV East and Southern Africa (ESARO) Regional Manager, Njoya Tikum, and a presidential volunteer-led public environmental clean-up campaign. In Kenya, the Cabinet Secretary for Labour Social, Security and Services responsible for volunteerism in the country, Ambassador Ukur Yatani, promised to finalize on the ongoing volunteerism legislation at a colorful event hosted by UNV on 30th November 2018 to mark the launch of the national volunteer week in Kenya. UN Environment's acting Executive Director, Ms. Joyce Msuya, while closing the same event, spoke passionately about her faith in volunteerism and how volunteerism built her character into the person she is today. Likewise in Zambia, Honourable Olipa Phiri Mwansa, MP, Minister of Community Development and Social Services, launched the International Volunteer Day on 4 December 2018 through a live telecast on Zambia National Broadcasting Corporation. In Angola, a group of UN Volunteers engaged with community volunteers to support low income households with basic livelihood skills and helped them with setting up of kitchen gardens, while in South Sudan, UN Volunteers engaged with other volunteer-involving organizations for market clean-up and community dialogue forums. UNV in Tanzania partnered with the Government, universities, the National Youth Council and volunteer-involving organizations including Voluntary Services Overseas (VSO), Red Cross Society, Japanese International Cooperation Agency (JICA) and Korea International Cooperation Agency (KOICA) and mobilized more than 500 volunteers for clean-up activities and a blood donation drive at government hospitals. The volunteers broke the record by gathering over 400 blood units. The activities were graced by Tanzanian UN Resident Coordinator, Mr. Alvaro Rodriguez and Minister for Health. Iram Batool and Tapiwa Kamuruko from the UNV East and Southern Africa Regional Office also joined UN Volunteers in the Comoro Islands for an event hosted by UNV, the local administration and volunteer-involving organizations to highlight the importance of volunteering for the development of local communities. In Ethiopia, UNV, with support from the Ethiopian Government and other UN Agencies, is organizing an event on 11 December together with other volunteer-involving organizations, including the Ethiopian Red Cross Society, VSO, KOICA, Cuso International, Rotary Club, Comitato Collborazione Medica (CCM) and JICA, among others. The high-level event is to be followed by a community service activity at a local orphanage in Addis Ababa.